How my favourite compliment in the whole wide world has turned into something less than desirable is beyond me. I usually never get involved in talk about popular opinions and the like but this is about perfumes, ah, I can't keep quiet o. 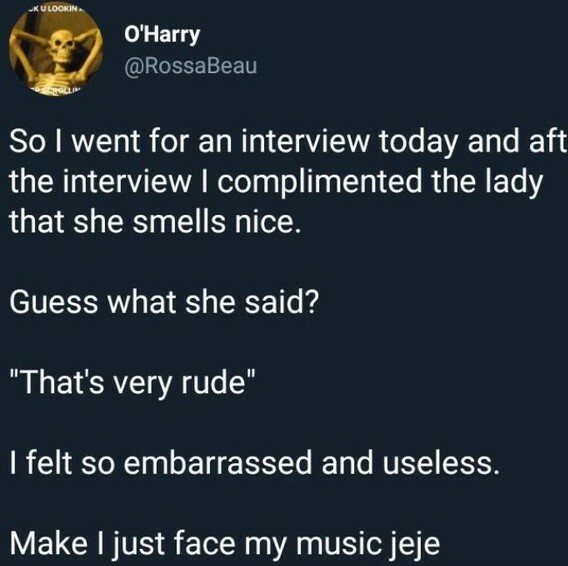 If you haven't heard about You Smell Nice, then living under a rock is definitely too good for you. and the avalanche was literally let loose. 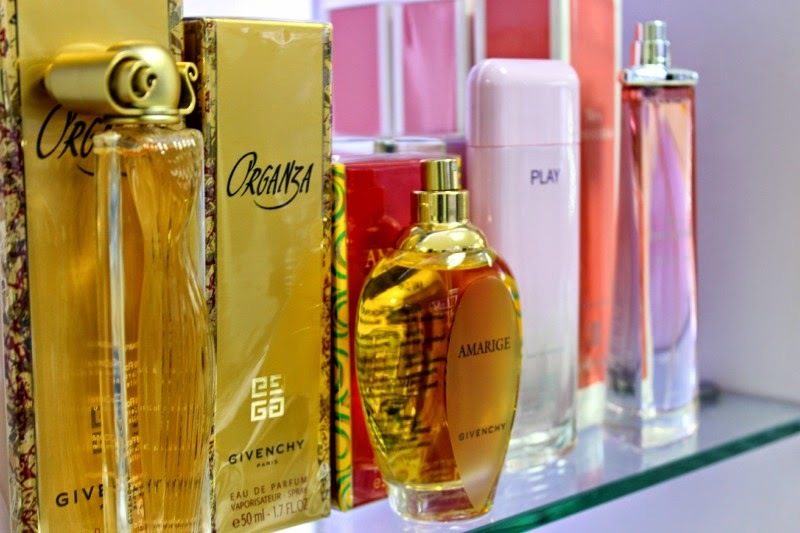 In fact, several perfumes have been designed and named 'You Smell Nice' by Taiwo. And Frank Donga also delivered his part of it. Let's leave the hype aside, why on earth did this tweet which ordinarily would have gone unnoticed become the topic of conversations a full 1 week running now? My 2 cents is it trended and became a viral topic because of one thing and one thing alone - EGOS. 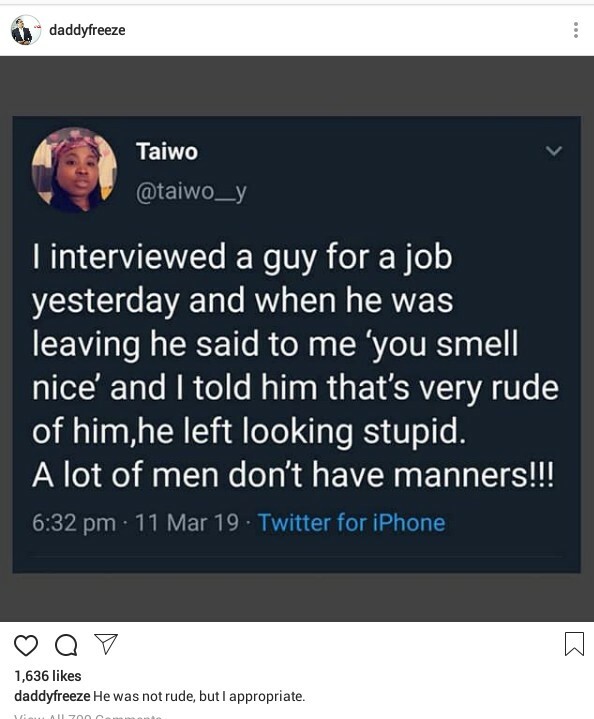 Taiwo as a HR professional who is of the opinion that people should respect themselves when in a professional environment. I mean, you might not work there yet but it still is a professional environment. A colleague who isn't necessarily close to me telling me I smell nice would be somewhat offensive to me. 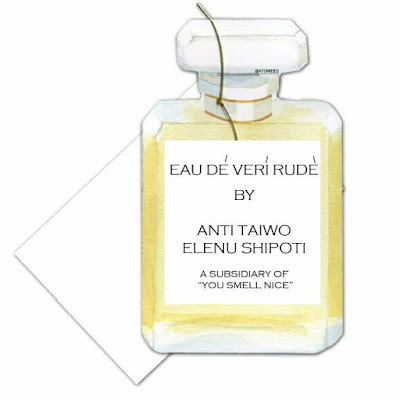 In the general sense however, it is not an out-of-place compliment...(like I said, my favourite ever because I'm a fragrance fiend - perfumes, deos, roll-ons, body splash, name it.) So to her, it was wrong - the environment and the person combined, made it a grossly undesirable compliment. 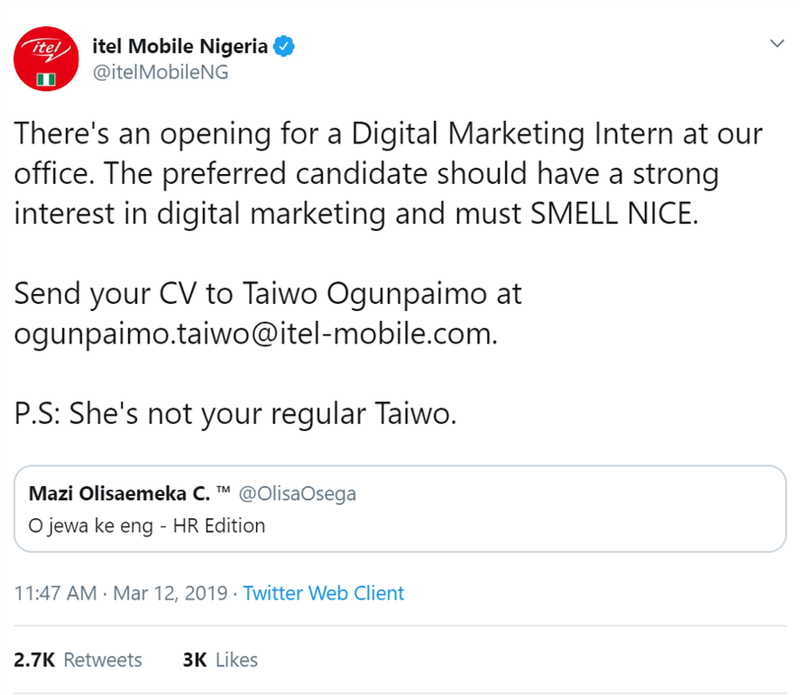 Besides, Taiwo lives abroad and their way of life is different. Even their approach to work in the work environment is different. I've had someone tell me before that I should be working abroad and not in Nigeria cos one thing I'm still trying to get a handle on is the need to be communal even in the work place. Why can't we just come to work, get the work done, be cordial with one another and go home? In essence, her ego was bruised one way of the other because the guy in question displayed bad manners = being rude. On the other hand, there is the guy himself. It sure didn't help when he went on twitter also and without naming names, said he felt embarassed and useless after she called him rude. I think that's a bit of an exaggeration - you went there for a job; really what business do you have complimenting the person conducting the interview? Tell me, if she had body odour would you have said, 'you smell terrible'? His own ego was bruised too because he was scolded in front of other people. Then, we have the rest of the world from micro-blogs picking up the story and asking people their opinions just for engagement sake to people & celebrities sharing their own experiences and everyone wondering how they would react if it was them or attempting to explain the actions of both parties. In direct response to the tweet though, there are mostly men and dayum, they have nothing good to say. I think it's a guy thing though - you know they have to protect the bro-code. Soooooo, if it was me, what would I have said to him? "This is neither the time nor the place for such a compliment so it isn't appreciated. However, I appreciate the courage to voice it out loud"